This week, we're excited to announce the launch of our NewsTrust Gadget on Google's personalized page service, iGoogle! iGoogle lets you create a personalized search page on Google, that gives you at-a-glance access to key information like headlines from top news sources, weather reports or even your own Gmail messages. It's a great way to get a deeper perspective on the news on your favorite search page, with links to our top-rated news and opinions from some of our most trusted mainstream and independent sources. You can customize your NewsTrust Gadget to separate news from opinion, view stories by topic, pick the number of stories -- and show more info like authors, quotes and star ratings. Please take a moment to install NewsTrust on your iGoogle page -- then let us know what you think, by posting your feedback on our suggestions page. Many thanks to Subbu Sastry and David Fox for their outstanding web development work to bring you this new service -- we hope that the NewsTrust Gadget will make it easier for you to find the best journalism on the web, based on quality ratings from members like you. Today, we leave the environment as our featured topic and move on to Presidential Election 2008. Going into Tuesday's primary, the media speculated as to when the Democratic Party would have its Presidential nominee and what this would mean in the November match-up against the presumed Republican nominee Senator John McCain. With Clinton's win, the race may not be decided for some time. With a close race, things had deteriorated in negative campaign ads, and a game of gotcha about Obama's ties to Reverend Wright and his statement to supporters in San Francisco that blue collar voters are "bitter" and about Hillary's refuted tale of coming under fire in Bosnia. The campaigns went negative in campaign ads about lobbyists and the one policy announcement was a piece of Clinton's saber rattling on Iran. All this probably leaves the Republicans hopeful that either Democrat will emerge as damaged goods come the Convention. Yesterday,McCain senior adviser Mark McKinnon told USA Today reporter David Jackson, "We're for anything that keeps it going." There has been coverage of McCain on his stance denouncing protectionism and another piece on reaching out to Black voters, but there has also been a piece questioning his "constituent services" in a New York Times story that has Ed Morrisey, who has left Captain's Quarter to write for Hot Air, complaining in "New York Times goes after McCain again, with similar results." McCain, of course, has the same problem Obama has; he sets himself up as a different kind of politician who is above mucking around in the political sewers with special interests while carrying on business as usual when it comes to his "special friends." In the larger scheme of things, this favor for Diamond is hardly a mortal sin. But as an example of campaign hypocrisy? Guilty as charged, Senator. All of this is leaving many of us tired. But evidently not the voters in Pennsylvania. As I wrote in my own blog post on the primary, AP reported that 1 in ten had changed their registration so that they could vote in the PA primary. And although some folks may want to get on with (or even past) the November race, turn out in Pennsylvania was high, as noted in the story we've featured today from the Washington Post, "Clinton Takes Pennsylvania:"
An estimated 2 million Democrats voted, nearly triple the number who turned out in the past two presidential primaries in the state. That post piece links to a slew of other coverage--news analysis, videos, transcripts and a photo gallery. My partner in leading our "news hunt" is longtime NewsTrust host Chris Finnie. Chris has already been at work since yesterday and recommends a piece of news analysis from 's Lorraine Woellert, "Bill Clinton `Firing Up' Rural, Small-Town Base Amid Stumbles." while the author is correct about what a charismatic speaker Bill Clinton can be, that too is slipping at times. Why, I can't say. But, when he spoke at the end of March at the California Democratic Party convention, people were leaving the room--me among them.... Like his wife, he seems to be feeling kind of desperate. She goes on the attack and talks tougher. He loses his temper and gets verbose. At least that's what it looked like from the cheap seats. Of course there's more than the horse race.We'll be looking to see if the media are covering important issues and policy positions.Will you help us out? The priority might be to look at todays picks and grab those without three reviews and then those with three reviews but lacking a detailed comment. It would be great if you'd link to other stories. If they're already in NewsTrust you can use that link so folks will see the other reviews. We'd also love to have folks, if they wish, submit good stories that we have missed. Member Roland F. Hirsch already has helped by suggesting sources and host Alan Horn and Barry Grossheim have done their first reviews. Other hosts have promised to join in soon. We hope you will too. Let's see what quality journalism is out there on Presidential Election 2008. Last week, the NewsTrust community searched for good journalism on the Environment, in partnership with Scientific American magazine and the Reynolds School of Journalism at the University of Nevada, Reno. 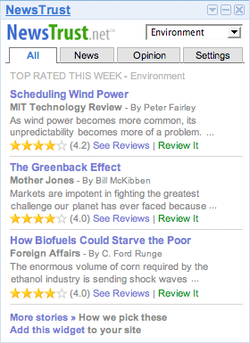 To see our current list of top rated stories, check our Environment topic page (click on the 'Top Rated' tab), which is continuously updated with new reviews. Covering the environment well is a tough task for a journalist. Environmental issues effect nearly all aspects of human life, so presenting a comprehensive look at even a narrow issue issue can be daunting. The highest rated story of the week, "Yellow River" succeeds in being both comprehensive and engaging. Writing for National Geographic, Brook Larmer brings the reader along as she explores of the myriad factors that have made China's Yellow River a veritable disaster. She touches on issues of geography, global warming, rampant industrial pollution, as well as the power and politics of this massive country. As Allen Warren, a graduate student at the Reynolds School of Journalism, put it "She did a wonderful job of putting the story in context and interviewing the real people that this story impacts, a necessary outcome because Chinese officials are loathe to comment on these topics. The language and imagery paint a scene that the reader can visualize." Governments around the world struggle with balancing the need for environmental regulations that often are at odds with the interests of business. In the New Republic, writer Jeffrey Rosen looks at how conservatives in America have tried to moderate regulation by both the EPA and state governments, playing both sides of the states' rights debate. Rosen contends that the inconsistent strategy may come back to haunt conservatives once Bush is out of office. The trading of carbon offsets, an issue all three remaining Presidential candidates support, is already in effect in the European Union. Salon.com writer Andrew Leonard reflects on how to read the response of this nascent carbon credit market to the precipitous rise in oil and gas prices. UNR journalism graduate student Teri Vance found Leonard's blog post a good start, but unsatisfying. "There were some good ideas presented in this blog," Vance writes, "but they weren't explained nor fleshed out very well. I was left wanting greater context, and some idea of how this could play out in the U.S.". Our media partner on this "news hunt" was Scientific American magazine. Stories from SciAm receive consistent high reviews on NewsTrust, with the publication ranking as one of the most trusted by our reviewers. Last week we featured several Scientific American stories on the site. Belying its often scholarly reputation, Scientific American is creating content online that's more casual and accessible for a younger audience. Their Monitor video program is case-in-point. Last week's episode focused on the Environment, used slick graphics to provide a roundup of environmental technology stories in the news. It's a brief video, and definitely worth watching. Tim Mitchell, a UNR journalism student, found SciAm's look at the dangers of compact fluorescent light bulbs thought provoking. As he explains, "these light bulbs have a danger that I was not aware of. I know they save a lot of energy but this story makes me think that we are just solving one problem with another one. Between the mercury threat to a child's health and the problem with disposing of them properly I think it is evident that there is a real need for more research on an alternative light source." Though not featured last week, I would also personally recommend a piece entitled "A Solar Grand Plan". This article considers a scenario where "a massive switch from coal, oil, natural gas and nuclear power plants to solar power plants could supply 69 percent of the U.S.’s electricity and 35 percent of its total energy by 2050." That was just a sampling of the stories our reviewers found on the Environment. For more great journalism, be sure to check out the Environment topic page on NewsTrust. We would like to thank our partners for their outstanding contributions to this week's news hunt on the Environment. From Scientific American, David Biello, Christopher Mims, Christie Nicholson and Ivan Oransky worked to highlight the collaboration to SciAm readers, many of whom checked out NewsTrust and signed on as members. We are honored to work with the folks at SciAm. Thanks! A big round of applause also goes out to the students at the Reynolds School of Journalism. In particular, Johanna Huybers and Kayla Dubchansky, who guest-blogged about the collaboration. As a young journalist, Kayla found NewsTrust serves as a pulse on what media consumers consider good journalism. Johanna explained how the students are taking the results of the Environment news hunt and applying them to a project aimed at greening the city of Nevada. Thanks to Professor Donica Mensing and David Rye for organizing the collaboration, to her UNR colleagues Edward Lenert, Larry Dailey, Rosemary McCarthy and Jerry Ceppos -- as well as to Johanna, Kayla and the other UNR students who reviewed stories on NewsTrust. Hope to you see you all back on the site soon -- be sure to join our upcoming news hunts! Over at the online journalism blog Paul Bradshaw has a great post on the editorial value of links. And he is absolutely right to take a moment and praise Jo Ind. In my conversations with editors I've actually had to argue the value of linking to outside sources. Now personally, I think this debate is dead and decomposed but, just in case, it goes something like this. A: We are in the business of informing people. C: If you provide good links, people will rely on you as a "news recomender" and come back for more. Take a moment to appreciate that argument and you can understand why we have Digg, Newsvine, Reddit, NewsTrust and other news aggregators. The links that are produced can ADD value to a news article produced by a journalist. That's why most of the news aggregators (NewsTrust included) create widgets that you can incorporate into your content with simple cutting and pasting. Here's an example from our recent collaboration with Scientific American. 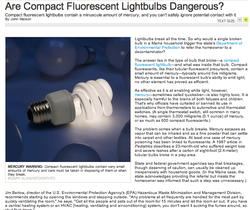 One article they produced was on flourescent light bulbs and their impact on the environment. It was a great story. Now imagine you are a first time Scientific American reader - you ended up on this article vertically through some search engine or clicking a link. After all, this is how tons of traffic is shifted around on the web - through search. You reach the end of the article, but you want more. Odds are you are interested in the environment, that's what your search terms were about when you landed on this page. Who knows, you might been interested in just this specific story. Instead of assuming the job had been completed by this one story, at the end of this article Sciam gave the reader a blast of information. They included a NewsTrust.net widget that displayed the top rated news articles on the topic of the environment (see image below). One of three things will happen at this point. The reader got all the information they needed and continues surfing the internet for other articles. The reader liked this specific story and submits it to NewsTrust for review - believing it should be on the list of top rated news stories. The reader sees the headline of a news story on this widget they found interesting and clicks over to read it. What does this translate to for Sciam? That reader may never return to Sciam again? Or at least - not until a search term brings them back - outcome is neutral to bad. Sciam becomes more than just a news source - they are a portal. The reader knows they can come back to Sciam not just for original environmental news, but to find out what is going on all over the web. Outcome is positive. Notice that the only bad outcome is with option number one - and that is the ONLY option if more links aren't provided at the bottom. The beauty of all this: It takes literally seconds to insert a NewsTrust widget. Here's a tutorial. Step one: Go to NewsTrust.net 's Tools page where you will find a link to our widget maker. Step two: Create your widget: It's a point-and-click operation. Just pick a subject, a listing (I suggest top rated), source type, etc. Don't forget to specify how many articles you want listed on your widget. Unless you know what size you need your widget to be, leave it on auto. Step four: Paste the script where you want it to appear. And then you're done. They also look great in the sidebar of blogs. If the topic you are looking for doesn't have a widget - contact us. As part of NewsTrust's news hunt on the Environment, in partnership with the University of Nevada's Reynolds School of Journalism and Scientific American, here's an update on what junior and senior level journalism students at UNR are learning and working on. As a group, we have been reading and reviewing news articles on NewsTrust that deal with the Environment. Our next step is to take what we have found and apply it to our own project on what Reno, Nev., can do to become a green city. Recently, Washoe County declared its intentions to make Northern Nevada leader in green technologies. Our project for the RSJ will focus on what college students and other UNR staff and faculty can do to make the campus more eco-friendly. We hope to promote awareness for busy college students that this is a hot topic for our generation. Some of the story ideas that we are working on include recycling programs at apartment complexes, features on what happens in the life span of a water bottle and easy ways to go green for at least a week. These are just our starting off points. Because our project will be entirely Web based, we want to include as much multimedia and user interactivity as possible. To do so, we are constructing photo assignments such as following a water bottle through its life cycle and Earth Day events around Reno. We plan to "go green" for a week and produce a video showing our efforts and some of the trials we encountered along the way. We hope that our final package will inspire UNR students to change some aspect of their lifestyle in order to incorporate a greener approach. We want this to be a social and cultural change, not just a product produced in a classroom setting. This is journalism in action and I am excited to be part of the wave of future journalists who can reach out to the community and ignite change. How do we minimize bias in a project like ours which seeks to help folks find good journalism online? "Ties That Blind?" is the title of a blog post written by Karen Tumulty, TIME's National Political Correspondent about relationships between politicians and firms which hire them as consultants. But loyalties can also blind us as news consumers. Might we prefer a stories that reflect our world views and distrust ones that challenge our beliefs? It's human nature say the psychologists and communications researchers who write about selective exposure. But there are some ways that we can guard against bias or at least reveal its potential. We can fill out our member profiles. Letting others in our community get to know you helps build a network of trust. And we can reveal any possible conflict of interest. You might be the author of the story. Or a friend of the author, or work for the story's publication. Or you might be featured in the story, or work for an organization that is related to this story. If so, please telling us, your readers, at the beginning of the comment section of the review form. And remember to rate these stories fairly. We need to avoid manipulating our ratings for personal, ideological or commercial purposes. When you let us, your readers know about yourself, we can decide whether your affiliations, political viewpoint or a relationship with the publication have biased the review. And we should respond in a like spirit, rating reviews for helpfulness, using adherence to standards of journalistic quality--fairness, balance, information, good sourcing--as criteria, rather than whether a reviewer holds a similar world view. In taking this path, we are following and rewarding the journalistic ethic of "disclosure" and resisting the idea that having an opinion or a relationship is the same as having a bias, or the converse that hiding ones opinions (even from oneself) and relationships eliminates bias. In fact, I'd argue that disclosure makes one more careful in the effort to avoid bias. And the feedback of ratings should make this goal that much more reachable, if not perfectly attainable. "A journalist can cast votes and have opinions, even strong ones, and still be fair. We do it by letting people have their say, by not putting our thumb on the scale with loaded language, and by having the modesty as reporters to admit that information is always fragmentary and it is our role to tell stories but not to pretend that we are society's High Court of Truth." Besides political viewpoint, affiliations and publishing relationships with our sources, we invite you to share in your profile as much personal information as you are comfortable with--about your occupation, location, journalistic experience, and so on. Not only will it make our site, as a whole, more trustworthy. It will also increase your transparency rating, which will give your reviews more weight. And it will help Kaizar, Tish and I give a higher validation score when we can verify items such as your web address if you have a site or blog, your occupation, expertise and political views. Or, you can opt to fill in the profile but hide it and we can still verify those items and raise your score. So, consider updating your member profile and reviews and helping us to put the "trust" in NewsTrust. And for the latest information on disclosure and other topics, check out our latest in the FAQ's here. I am lucky enough to be able to participate with NewsTrust.net this week as a guest blogger and NewsTrust reviewer. I'm a student of the University of Nevada, Reno and we have teamed up with NewsTrust and Scientific American magazine on the environment. As one of our assignments, the whole class signed up for NewsTrust and started reviewing environmental articles to become familiar with the Web site. We talked about it in class today and the feedback was very positive. We all especially liked that you can find multiple sources on a topic in one area. We also enjoyed how everything on NewsTrust is divided into different categories, making it very easy to navigate and find topics we are particularly interested in. One point a classmate of mine made was that NewsTrust is an important source because as young journalists we should know what other people consider good journalism. It is really helpful to look at other's reviews and see how people review an article and why they reviewed it that way. Personally, I am grateful to Fabrice Florin and Kaizar Campwala for working so closely with my class to give us the tools to read great writing and learn more about our field. The Reynolds School of Journalism online reporting class looks forward to this week with NewsTrust.net and Scientific American to research and write about the environment. Go Green! Our featured topic for this week's news hunt is the Environment, in partnership with the Scientific American magazine and with the Reynolds School of Journalism at the University of Nevada. Help us find great journalism on issues ranging from global warming to green technology, water pollution and environmental justice. On Earth Day, April 22, we'll announce the results of our collective search on our blog. Please join our news hunt, and review (or submit) quality news and opinions on the Environment. The environment is without a doubt one of the greatest challenges ahead, not just for the United States, but for all of mankind. Few subjects have that much importance for our world. News sources like Scientific American, one of our partners this week, have huge burdens when covering environmental issues. As far as journalism goes - the environment is one of the most difficult subjects to cover, period. A good reporter must be versed in technology, science and economics, just for starters. Yet for all its nuances - the environment is set to become the defining crisis of a generation. There is a serious demand for informative, timely and of course accurate information. I know first hand how difficult it is to report on the environment, which is why I'm especially pleased that we are also partnering with the Reynolds School of Journalism at the University of Nevada, Reno. This week, thirty of their journalism students will lead the charge, evaluating stories to filter quality information from misinformation. Some students will also be blogging here at NewsTrust. Using NewsTrust as an educational tool will give these students a chance to absorb what they are reading and ask critical questions. They can confront and analyze journalism produced by some of the most respected news sources like Scientific American, Wired, and the Economist. As these students become leaders in the journalism community - we want them to be well versed and aware of the delicate issues involved in environmental reporting. And then of course - there is our third partner: You! In many ways - your are our most important partner of all. The environment is not a partisan issue. You'd be hard pressed to find a politician who doesn't agree with the idea that we should keep the environment 'clean and safe.' You'd also be hard pressed to find a reasonable person who doesn't generally agree with that statement. The problem is knowing HOW to reach this objective and at what cost. That is in part where the reporting comes in - but it is also where you play a critical role, using your knowledge and expertise to evaluate the reporting. Not everyone is a journalist - but everyone is an expert in something. To the extent that the environment touches every aspect of society, your expertise can be used to weigh the importance, fairness, accuracy and other aspects of a news story. Then of course - there is the final role that you play, not just as a reviewer, but as a human being who is tied to the fate of the planet. We hope that you will take what you learn while reviewing (education is always a two-way street) and put it into action. That's what NewsTrust is about - education that enables positive action. So, take a deep breath (if you are lucky enough to live in a region of fresh air) and join our news hunt. We have plenty of good news articles, opinion pieces, special reports and more for you to review and rate. There has never been a better week to start being engaged as a NewsTrust reviewer. We will report back what we have found on this collaboration on April 22nd, Earth Day. Enjoy! What News Do You Share? Is Your Site Optimized for Social Media? I'm always weary of news buzzwords - but this one caught my eye: "Social Media Optimization." At this point in the web's development "search engine optimization" is standard. I challenge you to find a serious web publisher who doesn't recognize the acronym SEO from a mile away. Social media, however, isn't on everyone's radar. My question in reading this blog post from the Early Edition, which tipped me off on "Social Media Optimization, isn't how news organizations can leverage social media to get more traffic - but on what rubric they are doing so. Do we want news organizations to clamor for traffic or quality reporting - and is there a way to achieve both? Last week on NewsTrust, we searched for good journalism about the Global Economy, with a focus on the rising prices of commodities. 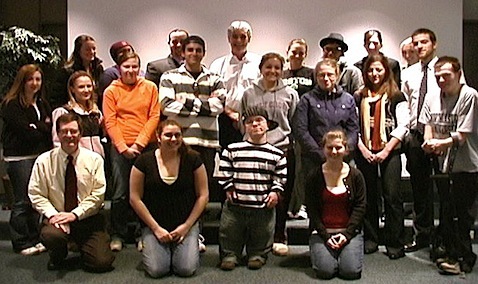 We we all found some great stories on this topic, in partnership with Link TV and students at Northeastern University's School of Journalism, led by professor Dan Kennedy. The complexities of trade across diverse national and local economies make reporting on the global economy a challenge. This is particular true about the price of commodities, which impact nearly all economies, but affect them differently. In our view, the best journalism is able to both explain the multiple causes of the rise in commodity prices and highlight its consequences in different parts of the world. A top-rated video feature from Link TV's Global Pulse series showed how various media outlets around the world covered the World Wheat Crisis. According to Jessica Torrez-Riley, a journalism student at Northeastern University, "the video puts into perspective how different cultures and countries are being impacted by the price inflation." Another fine article from the Financial Times got high marks from Evelyn Messinger, the series producer of Global Pulse. She writes, "this FT article tells an important story - that the effects of skyrocketing food prices will affect Africa differently than elsewhere." Messinger also gave a positive rating to an analysis of the "conundrum over food prices and poor farmers" from The Economist, a go-to source for in-depth analysis of the global economy. Chelsey Pieretti, another student from Northeastern, submitted an excellent Time article about the environmental and economic impact of bio-fuels entitled "The Clean Energy Scam". As she explained in her comment, "I had very little knowledge of biofuels going into it and I feel like I have learned a great deal about what their use means for various countries and for society as a whole." A pressing issue that emerged from the news hunt was how rising commodity prices are challenging the ability of the developed world to provide food aid to the parts of the world that rely on this aid to supplement inadequate local food supply. Two pieces, one from the Los Angeles Times and one from the Inter Press wire service do a great job of explaining the politics and economics that feed (or starve) millions of people every day. Video turned out being a powerful medium in covering this issue. Besides the Global Pulse story on wheat prices, NewsTrust reviewers found a lot of value in Link TV's Mosaic Intelligence Report on the bread crisis in Egypt, and a great report by Bill Moyer, "Hope in the Congo". As video journalism increasingly moves online, we're hoping to see more submissions and reviews of quality video stories on NewsTrust. Check out other stories from video news outlets. Speaking of video, check out this excellent segment from Northwestern student Jessica Torrez-Riley, documenting NewsTrust Editorial Director Rory O'Connor's presentation to professor Dan Kennedy's journalism class last Wednesday, as well as perspectives from students following their reviews of this article from the National Post. The students generally gave this article low marks, due to its weak sourcing and lack of verifiable factual evidence. This is a great example of how NewsTrust can be used as a literacy tool in the classroom. Also, be sure to review professor Dan Kennedy's thoughtful observations about his experience with NewsTrust last week, which will help guide our next steps in developing our service in coming months. Lastly, we would like to give a big thank you and round of applause to all our partners this week, from Link TV's Evelyn Messinger and Roger McDonald, to Northeastern's Dan Kennedy and the students in his journalism class, for their outstanding contributions to NewsTrust this week. We couldn't have done this without you! Jessica Torrez-Riley, Stephen Asay, Brian Benson, Erin Cahill, Bailey Clear, Mitchell Paolo Esteller, Brendan Gupta, Derek Hawkins, Eleni Himaras, Danny Kowalski, Jessica MacNeil, Maureen McLaughlin, Stacey Perlman, Chelsey Pieretti, Casey Ramsdell, Erin Semagin Damio, Candice Springer, Bianca Strzelczyk, Kelly Sullivan.